Cold calling is used by both startups and flourishing businesses to make new links, to promote the product or to hire some candidates for a job. During cold call a recruiter plays many roles as a caller, an interpreter, a guide or representative of company. So its important every recruiter follows cold calling tips before scheduling any interview. The responsibility to get new talent in circle or to make fresh business deals depends on one call. With the help of refined skills, this call can bring the most important business of the day. It can start a new success story for the company. To bring this dream into reality the content can be designed and tackled according to the situation and an independent charge is given to the recruiter. Modern day Recruiters follow these cold calling tips from us. The main purpose of cold call is to expand the business or shortlist a suitable candidate for the vacancies in any organization. Cold calling from work place is economical. It saves time and gives a clear picture of the number of candidates interested in the job. It also gives immense confidence to the recruiter. On negative side this approach can also bring rejection, embarrassment or depression because not all the recruiters are aware of right approach. Cold calling is just like another way of managing a business or knock at the door by a sales personnel. Only difference is that the recruiter is not travelling and spending money and precious energy to meet an unknown person. There are many methods to turn a single call in a successful deal, but nothing is infallible. 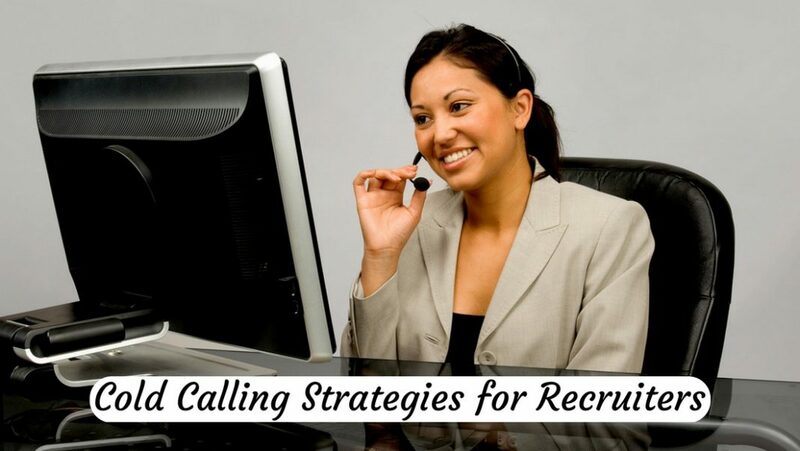 Cold calling can be a success if the recruiter keeps some points in consideration. People in sales have different opinion about it. They consider it as a number game, a fearful target which is not realistic. They are scared to confront the situation. It is also repetitive and monotonous. Rejections are taken on heart and create an unpleasant feeling. All these problems occur because of the poor cold calling techniques. Unwanted calls at the wrong time are never welcomed by any one. It creates a lot of nuisance. Some people get the calls from a trainee who shows complete lack of interest in the conversation. They are unprepared and disrespectful in their approach. People show them a cold attitude and sometimes insult them also. This brings a feeling of dejection in the recruiter. A recruiter can make a cold call an achievement by imbibing certain qualities. Some of these qualities do not bring fast business, but surely can work for life-long commitments. Honesty is the only policy for a caller here. Wrong information at any stage can be detrimental. Always provide authentic information. For long term profits and good contacts, straightforward methods and professional approach is required. The ways of cold call should be innovative. They should create a sense of curiosity in listener. All information should be interesting and according to a well prepared script. Efficiency to put these points in conversation is required from a professional cold caller. These qualities do not come in a day. A person has to struggle to find new strategies for opening new business deals or to recruit fresh batch of employees. Cold call should never be seen through a recruiter’s point of view or a candidate’s point of view. It can be solely seen through business perspective which will give benefits to both the recruiter and the person selected. The recruiter should keep the thoughts of successful conversation in mind. Your approach to start the conversation should be positive. Main focus should be on a specific group. Right person, right timings and right approach can bring you business. Your one successful call on targeted person can change your strategy to work and win. To achieve that target you have to do research and find the most desired candidate. During the whole conversation there should be no fear of rejection or embarrassment. You should concentrate on positive thoughts and bring a smile on your face. Holding this smile for few seconds will surely uplift your mood. Give assurance to yourself and dial the number confidently. Greetings should be preferably according to the time of the day. You may take the permission to start the conversation asking politely “Is it the right time to talk to you?” This question can be asked in another way like, “Can I take a few minutes from your precious time?” This will surely give you confidence to start your conversation more clearly. Be always ready for a negative response also. On being rejected you can ask for another suitable timing to call. In your conversation do mention time and date. “Can I make a call tomorrow around 11am?” At this point make sure you note down the timings for the call and do call up once again at the given time. This strategy will give you a chance to talk to that person for second time. This will give you a firm ground and you can talk more confidently. You should always give priority to the person whom you are talking to. This skill is helpful and makes you a better listener also. Remember the clock is ticking and time is very limited. You have a few seconds to complete what you want to say. Here you have only one chance to make an impact. Research says that initial few seconds, tone of the caller and the way candidate is addressed makes a huge impact. Your tone should be clear. The name of the candidate should always be pronounced correctly. Your lack of confidence in addressing can disappoint the person .It can annoy your caller severely and can make your work difficult. Half broken tone in reading name or surname can make your work an uphill task. In order to avoid small mistakes do some practice before making a call. There are experts who can guide you or you can join professional guidance course before taking the task in hand. You can always do practice in front of mirror for a few minutes before starting the calls. Very small but extremely important points can be kept in mind like use simple short sentences. Provide bits of solid information and don’t let it be lengthy. Jargons can deter even a prospective candidate. Your voice should be moderate with clear pronunciation and accurate stress on important information. You should talk to the point and try your best to start the ball rolling. Another essential document for a recruiter is a seriously designed call list . It has to be updated on regular intervals as it can make your work easier. Out dated number records not only create confusion but also multiply the work load. If it is an international call, you should check and dial numbers with proper International codes. There must be additional information about the present job and reasons for job change of the candidate. Clearly planned list saves a lot of time and energy. It helps the caller to start the conversation more quickly. A recruiter can make use of online resources like e-mails or direct mail to send the proposals of the company. This interaction can make the task easy. Mail should be impressive, informative and well designed. Casual mails written without thought ends in trash bin. It is important to make writing style impressive. Practice the art of expressing a lot in few words. Do learn the art of concluding the conversation immediately if the person shows no signs of interest. Very respectfully you can finish. If the candidate does not find your offer suitable, you can ask about the desired job the candidate is looking for. At this time you can write down given requirements by this candidate. Even if there was a rejection then also you are successful to find about alternative job options the candidate is looking for. So always look for the silver lining. Here you can request for the contact of some other friend who can be interested. The contacts made during the conversation can be of great help. It not only creates an image of the caller in person’s mind but also reflects the qualities like clarity of subject matter, confident approach and convincing power. A recruiter should consider all positive impacts of this business as cold call is itself a business. The whole business can be started with just a cold call. A recruiter should adhere to official timings to make calls. You should be very well versed with right time if the call is made to a candidate residing in another country. Siesta time or power break time, which some companies provide should be completely avoided. You can always request for another suitable time, if the person is travelling or in a meeting. Immediately note the time and do plan for a call at given time. People are always busy, it is the recruiter who has to make his timing accurate. A well written script will help you to be clear of your goals. Be precise and remain focused. What do you want to tell should be well written in front of you. Use simple sentences and divide the information in parts. You should be thorough with technical points. Once the candidate shows interest, you can provide further information. It can be related to job profile, company’s policies and rules of recruitment. It is always wise to keep a copy of technical answers in front. At this stage information can be given on demand only on the basis of interest shown by the candidate. A recruiter can assume set of questions and give the answers for them by keeping them in front. This will help to save time from unnecessary stress which can come up if the candidate asks something. A recruiter must have clear guidelines to deal with gatekeepers. They should be taken as advantage and not as a hindrance. You should be very pleasant even if the voice from another side is from front desk. Very politely a request can be made to contact the right person. If the person is unavailable, you can make further enquiry, like “Can you please tell me the appropriate time to contact.” Remembering the names of gatekeepers and having short conversations with them can help a lot. They can become a password to open the cold calls. Do remember to take a short break of 3 to 4 minutes after completing a long list of 15-20 candidates. Stretch your limbs, take a sip of water and with a deep breath, go back to phone. After learning so much another bitter lesson is to be prepared for rejection. A day can be without any positive response. At this point getting dejected is quite common. To make this failure as a stepping stone is the quality of very few. In such circumstances do self analysis and find out what went wrong during the call. How did you start the conversation, what were the expectations of the candidate? Did you use a realistic approach? Were you fully enthusiastic? Did you approach the right candidate? Make a list of these points. Start working on these. Definitely improve upon your shortcomings before dialing the next number. This will give you more confident approach and better strategy to talk to the next person. Even if the call was a failure, learn to forget and go further. If someone has given a cold answer or used impolite tone, remain calm. Never enter in heated conversation. Always remember you are the representative of an esteemed company. One wrong word of yours can bring a spot on the image of the company. So remain serene and do not exaggerate the incident. Do keep a backup plan ready to dial again. If the cold call is a success you should be ready with detailed information about the process to be followed. Fix the meeting timings and keep a track. Do set reminders to call up the candidate once again before the interview. This time you can give all information and guidelines to the candidate. The candidate will wait to hear from your side. This call will not be a cold call. Previous articleBest (Top) Performers – How to Identify, Hire and Retain Them?